Below you will find listings of vending machine suppliers in NORWAY, Norwegian vending machines which includes Snack, Soda, Drinks, Food, Deli vending machines, Coin Operated Amusement games, Machine Repair Services and more! Be Jam Free…with MEI. Keep your machines running, not your service techs. MEI Series 2000 Bill Acceptors. MEI is one of the world’s leading manufacturers of electronic bill acceptors, coin mechanisms and other unattended transaction systems. Today, MEI electronic payment systems are relied upon for over 2 billion transactions per week in more than 100 countries worldwide. Place your Norwegian vending company listing here! Click here to place your company listing! Repant is a supplier of complete high-quality reverse vending systems for both one-way and refillable beverage containers. The systems include reverse vending machines (RVM), deposit cash flow systems, service management systems and container logistics management systems. 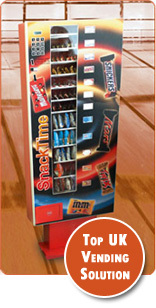 Snack time UK office vending machines for hot drinks, coffee kenco, nescafe, tea, cold drinks, pepsi, tango, snacks, crisps, chocolate. Small office combo, drink and snack vending machines. Each vending machine is installed and serviced free with no rental charge.